There's no need to buy expensive scanner hardware and free up extra storage space - put your camera to good use and let booksorber take care of the rest. Did you ever spend hours in front of a copier scanning book contents? 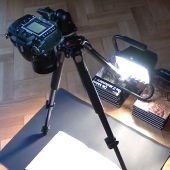 In comparison, photographing a book can be done very efficiently. Taking a picture is instantaneous and turning pages is easy since neither the book nor a glass plate have to be moved. This means you can process a 500 pages book ("Lord of the Rings" class) in under 7 minutes! Today, digital cameras are readily available and have excellent resolution. 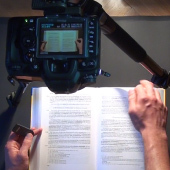 Still, raw images of book pages are distorted due to page curvature, usually suffer from uneven illumination and need cropping which is complicated by imprecise alignment. Therefore the post-processing necessary to produce a decent ebook is very challenging. A lot of research has gone into booksorber's sophisticated algorithms to solve these problems within an automatic and streamlined workflow. 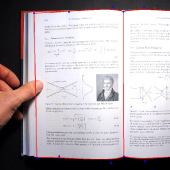 Page curvature, for example, is corrected based on automatic detection of the curved page boundaries. Even fingers in the picture are removed. The results are comparable to what you would get with much more expensive industrial book scanners! Check out the example pdf files in the Demo Media section! Even if the automatic page detection should fail, an intelligent semi-automatic mode is available, so that manual intervention in post-processing takes a few minutes in the worst case. PDF files are supported on most platforms and devices. It's a good starting point for subsequent Optical Character Recognition (using a third-party tool like Adobe Acrobat) which makes documents easy to annotate, full-text searchable, and significantly reduces file size. 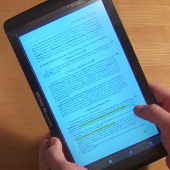 Using openly available software, the output can also be further transformed to eBook-Reader formats like EPUB or MOBI. Booksorber itself is available on Windows, Linux and Mac.